In contrast to the observed strengthening, the majority of climate computer models simulates a gradual weakening of the Walker Circulation when forced by increasing greenhouse gas concentrations (see Figure 1). “The discrepancy between climate model projections and observed trends has led to speculations about the fidelity of the current generation of climate models and their representation of tropical climate processes”, said Eui-Seok Chung, researcher from the Center for Climate Physics, Institute for Basic Science, South Korea, and lead-author of the study. To determine whether the observed changes in the tropical atmospheric circulation are due to natural climate processes or caused by human-induced climate change, scientists from South Korea, the United States and Germany came together to conduct one of the most comprehensive big-data analyses of recent atmospheric trends to date. “Using satellite data, improved surface observations and a large ensemble of climate model simulations, our results demonstrate that natural variability, rather than anthropogenic effects, were responsible for the recent strengthening of the Walker circulation”, said Prof. Axel Timmermann, Director of the IBS Center for Climate Physics at Pusan National University and co-author of this study. In their integrated analysis, the researchers found that the satellite-inferred strengthening of the Walker circulation is substantially weaker than implied by other surface observations used in previous studies. “Putting surface observations in context with latest satellite products was a key element of our study”, said co-author Dr. Lei Shi from NOAA’s National Centers for Environmental Information in the United States. Analyzing 61 different computer model simulations forced with increasing greenhouse gas concentrations, the authors showed that, although the average response is a Walker circulation weakening, there are substantial discrepancies amongst the individual model experiments, in particular when considering shorter-term trends. 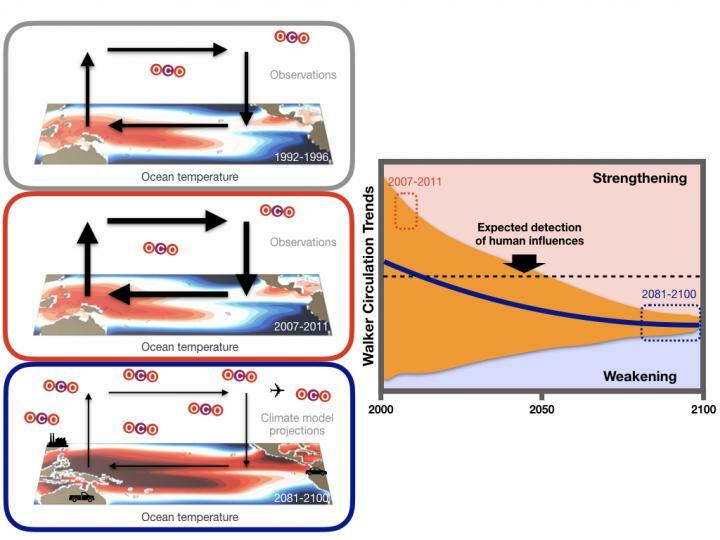 “We found that some models are even consistent with the observed changes in the tropical Pacific, in stark contrast to other computer experiments that exhibit more persistent weakening of the Walker circulation during the observational period”, said co-author Dr. Viju John from EUMETSAT in Germany. The authors were then able to tease apart what caused the spread in the computer model simulations. Co-author Prof. Kyung-Ja Ha from the IBS Center for Climate Physics and Pusan National University explains “Natural climate variability, associated for instance with the El Niño-Southern Oscillation or the Interdecadal Pacific Oscillation can account for a large part of diversity in simulated tropical climate trends”. “The observed trends are not that unusual. In climate model simulations we can always find shorter-term periods of several decades that show similar trends to those inferred from the satellite data. However, in most cases, and when considering the century-scale response to global warming, these trends reverse their sign eventually”, said co-author Prof. Brian Soden from the Rosenstiel School of Marine and Atmospheric Science, at the University of Miami, United States.